PHILLIPSBURG – Phillipsburg senior Chris VanKooten and sophomore Noah VanKooten are cousins. The duo spent their childhood together and been best friends all their lives. They often spent time at their grandmother’s house playing football. Now, the VanKootens are starters on the Panthers’ depth-laden offensive and defensive lines. A veteran, Chris starts on both sides of the ball. Noah is a first-year starter at nose guard. On Friday, Phillipsburg’s all-around play, especially up front, carried the Panthers to a dominant 56-0 home win versus rival Norton in Class 3A, District 14 action. Phillipsburg, ranked second in the classification, moved to 8-0, 2-0. Norton dropped to 6-2, 1-1. The Panthers collected its second straight outright Mid-Continent League crown. Norton/Phillipsburg is historically a very close rivalry with generally low scoring games and the road team winning. From ’04-16, Phillipsburg was 0-6 at home versus Norton, a statistic the Panthers’ coaching staff knew. In the last 14 meetings, this contest marked the most points scored by a team and easily the highest margin of victory. Friday was the Bluejays’ biggest margin of loss since a 2007 season-opening 60-0 defeat to Smith Center, statistically the most dominant team in state history. This fall, Norton’s lone two losses came against the Panthers and the Redmen (43-0). Phillipsburg led 7-0 at the end of the first quarter, 35-0 at halftime and had a running clock with 6 minutes, 42 seconds left in the third quarter. The Panthers won their 20th straight regular season contest. Afterward, Chris VanKooten pointed to the scoreboard and said “that zero” was the most impressive part of the win. At halftime, the Bluejays had one first down against two turnovers. Overall, senior quarterback Jace Ruder, a North Carolina commit, finished 3 of 12 passing for 24 yards with two interceptions. Pressured all night, he collected 10 carries for 25 yards. Senior running back Tevin Petrie delivered 10 carries for 18 yards. Phillipsburg opened the game with a 13-play, 80-yard drive that ended on a five-yard scoring run from senior Kirk Coomes. He tallied 14 carries for 116 yards and three rushing scores. Defensively, he batted one pass in the air and then picked it off to set up a short field and eventual TD. 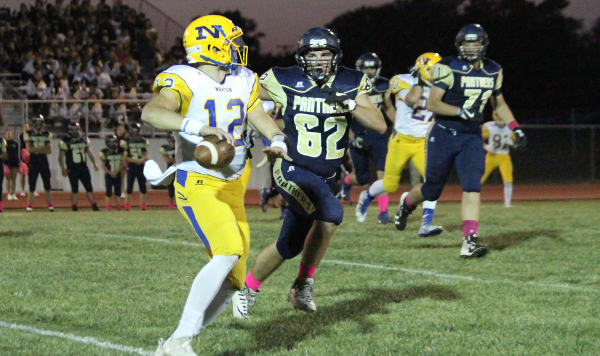 Norton had six yards on its first three plays and faced a 4th-and-4 from the Panther 48-yard line. The Bluejays used a formation Phillipsburg hadn’t seen, and the Panthers quickly called timeout with 4:40 remaining in the first quarter. Ruder went for the fake punt and tossed an incompletion. “We were still expecting them to punt the ball, and then when they faked it, it worked out all right for us,” Covington said. After a Panther fumble, Norton had just two yards on its next possession before a punt. Of the offensive linemen, Chris VanKooten and senior Nate Tedford, a first-year starter, also start on the defensive line. Junior Kasen Keeten is a starter on the offensive line and at linebacker. On a team with 16 seniors, Phillipsburg rotates more than 10 Panthers on the defensive line. “The depth that we have been able to develop just pays off huge for us,” Covington said. The 6-foot-2, 225-pound Tedford has especially impressed after he replaced all-state lineman Seth Jacobs. He recovered a second-half fumble. “After football season, Nate really turned it on in the weight room, and had a great offseason, great summer and he’s another just a big physical guy with a great motor for us,” Covington said. Noah (6-4, 255) often lines up next to Chris (6-1, 230) on the defensive line. “Very honored, because last year I would be the one who would be on scout team, being pushed around, shoved down, all things like that,” Noah said. Chris, known for his mean streak, credited his mother, Kristine, for helping him develop the trait. Noah said his toughness comes from his mother, Melinda. Coomes opened the second quarter with a nine-yard run for a 14-0 lead. Then, senior Trey Thompson intercepted Ruder and set up a short field. Junior quarterback Trey Sides tossed an 18-yard scoring pass to senior Braden Juenemann, the first of his two touchdown passes, for a 21-0 advantage. Later in the quarter, Chris VanKooten broke through for a sack. “Very close-knit family, and you can tell the moms have raised them right,” Covington said. “They are good kids, and they have both have huge motors, and that’s the key. To be a defensive lineman, not get a lot of credit, or an offensive lineman, not get a lot of credit, sometimes it’s not a whole lot of fun. “But those guys, I think they really do have fun playing with each other and playing with their teammates and even in practice, they are competitive guys,” he added. On the next drive, Sides found Thompson for a 20-yard score. After Coomes’ interception, senior John Gower tallied a three-yard TD just before halftime. Gower had 14 carries for 83 yards and a pair of rushing touchdowns. Junior Treylan Gross finished with 12 carries for 130 yards and a score.